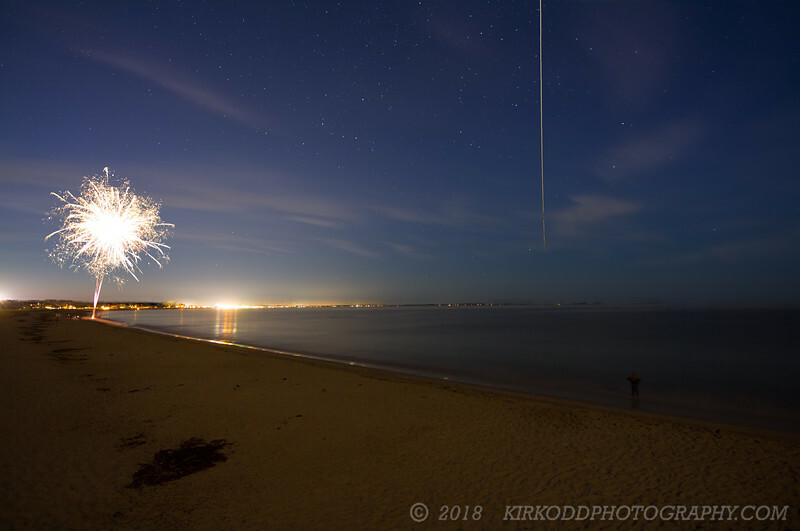 This time lapse composite image captures the International Space Station as it flies over Ferry Beach in Saco, Maine. The lights on the horizon are Old Orchard Beach. Timing Credit on this one goes to Mike B and the Android developer team that made the International Space Station tracking app. We set up the camera and the tripod on the lifeguard stand and used a smartphone app to tell us when the station would be coming by overhead. Individual 15-second exposures were captured and combined in the star-stacking software package Sequator to amplify the night sky without creating star trails. A separate sequence of images were merged to create the trail of the space station as it passed overhead. A final image capturing the fireworks was added at the end (some locals were putting on a nice show, and it was perfect timing!). Raw to JPEG conversion was done in Adobe Lightroom 6. Final processing and layer addition was done in The Gimp 2.8. Camera equipment was a Canon Rebel T2i with a Tokina F2.8 11-18 lens.